Graciela Iturbide is a celebrated and influential Latin American photographer, whose work has promoted feminism and cultural awareness. So why on earth would any of her work condescend to appear here? In a word: iguanas. One of her most famous photos is of Nuestra Senhora de las Iguanas, or Our Lady of the Iguanas. Yes, she's wearing a head dress of living iguanas. This is one of the few extant photos of Nuestra Senhora; the iguanas wouldn't cooperate by posing properly, so most of the other photos were scrapped. What's fascinating about this photo (as if an iguana hat weren't enough) is that it highlights a throwback to pre-Columbian Mexico and Zapotec life. I'm very curious to know what's keeping all those iguanas in place. But maybe I'm better off knowing. Thanks for the story, Niner. 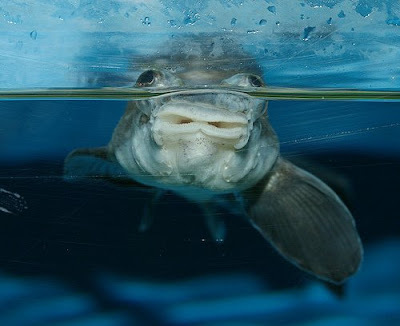 Wolf fish are known to be inquisitive, even friendly fish. But this one's giving off the same vibe I give when I've just woken up, my wife's opened the blinds, and I really, really need just a little bit more sleep. Or, it could be the same look my dog used to give when he knew he had just been naughty. Some days you just don't want to be bothered. You've had enough. 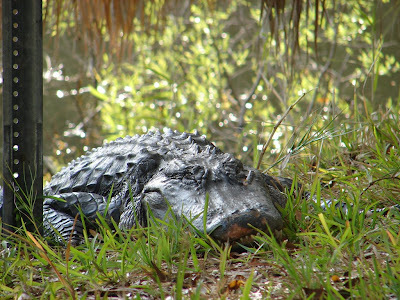 You want to sun your scaly hide on the bank of a palm-lined swamp and not be bothered by humans swimming nearby, or having those same humans molest you. Where's an alligator to go to find such a sanctuary? Why, beneath a sign just like this one. Such a smart gator. 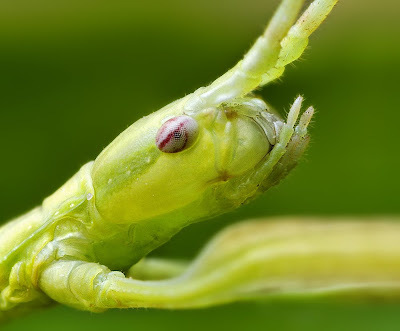 Christie (who has a fantastic blog named Observations of a Nerd, devoted to all things biological), found this guy in the Boyd Hill Nature Preserve in St Petersburg, FL. I imagine he wouldn't mind being fed, but that's the price he's willing to pay for some peace and quiet. In the second shot you can see just how at peace he is. 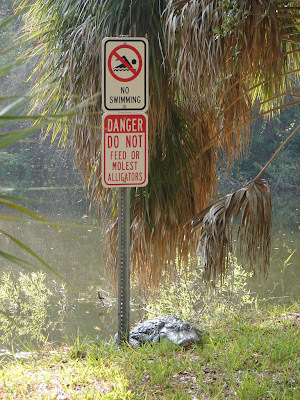 Don't worry, little gator, I won't molest you. And I'll take my swim trunks and find another, less fangy hole in which to get swim. Thanks for the photos, Christie. Wait, what's this? Cute little seastars? Wombat, I've bought pillow versions of these and slept on them. If anything, this photo makes me want to eat some lemon meringue pie. 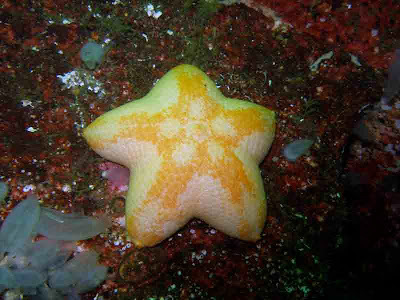 I know, the cushion star isn't ugly by any means. 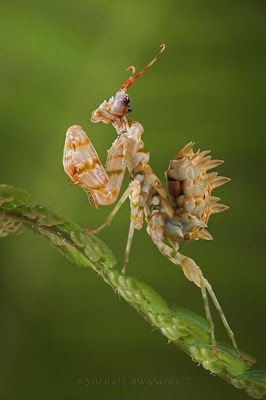 It's almost adorable, with its poofy nubs for arms and radial symmetry. At worst it deserves a starring role in Sponge Bob Square Pants. 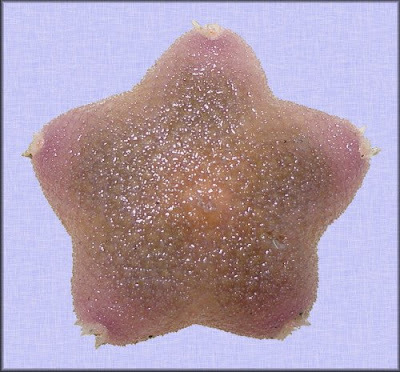 I'ts not until you hold Pteraster tesselatus, aka cushion star or slime star, or see it threatened that, its true nature is revealed. That's right. That's slime. Oodles and oodles of it. Native to the Pacific coastline from the Bering Sea to Carmel Bay, California, this seastar secretes a copious amount of slime as a defense mechanism. 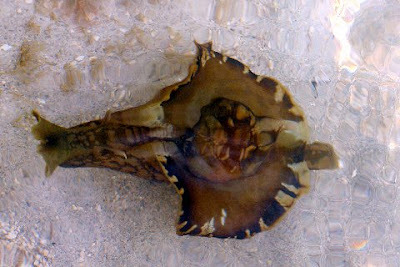 Predatory fish and mollusks have been known to suffocate after being smothered with seastar slime. It may not be pretty, but if it works, it works. 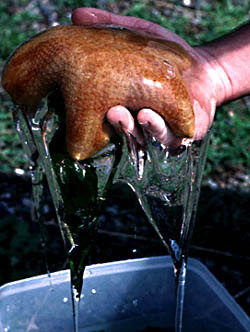 I'm wondering if you can use seastar slime in place of egg whites, just like with hagfish slime. Anyone care to find out? 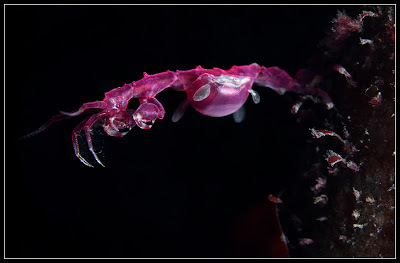 Alexander Semenov is a Russian diver and scientist. 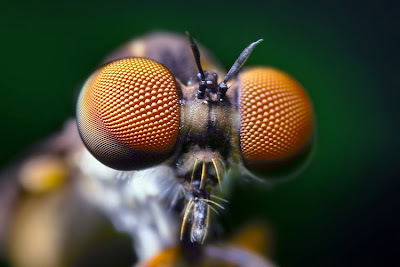 He's also a masterful photographer. He's pointed me in the direction of his Flickr sets, and I'm eager to share. I'll be doing several posts on Alexander's work. 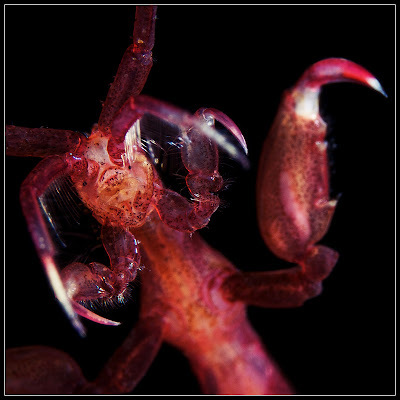 He took these photos this past Summer while diving at the White Sea Biological Station of Moscow State University. 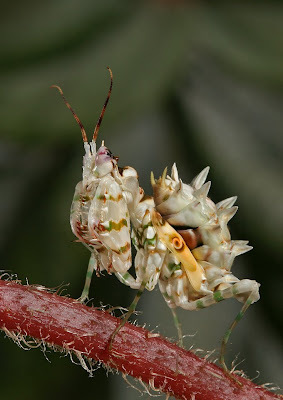 Enjoy this first, very diminutive creature. 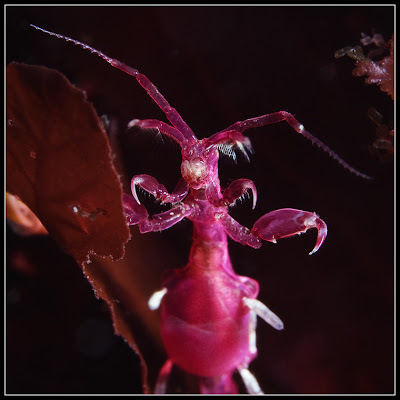 You're looking at a skeleton shrimp (Caprella linearis), most likely of the male persuasion, given its elongated head. They're too small to batter and fry, or to serve with cocktail sauce, so you'll only be able to take it in through your optic nerves. I doubt the shrimp minds. 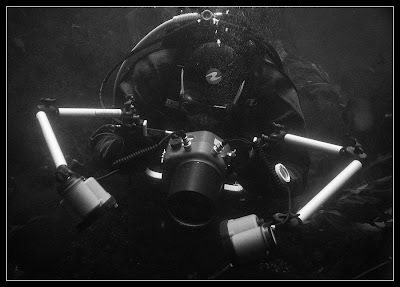 In case you're wondering how he took these photos in the murky depths of the White Sea, here's how. Look at that setup! I need to go apply some rouge to my face to counterbalance the envy-green tinge it has just assumed. A lot of us are looking to carve out a little niche for ourselves on the stage of life. Maybe find a little fame, perhaps a little fortune. It's hard though. You've got to find something you're decent at doing, maybe find something no one else is willing to do, and try to be the first one to do it. Novelty can take you places. 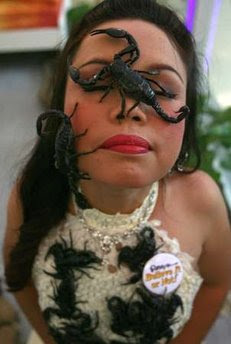 So to you, Ms. Scorpion Queen, I tip my hat. Hey, your gig beats blogging any day. Bonni needs your help. 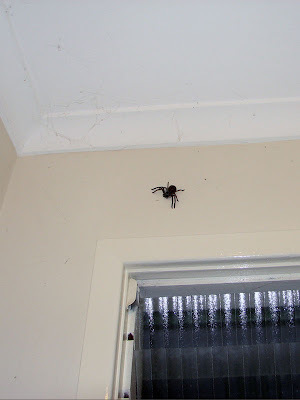 She encountered this spider (see the lower picture for scale) above her toilet in Australia. 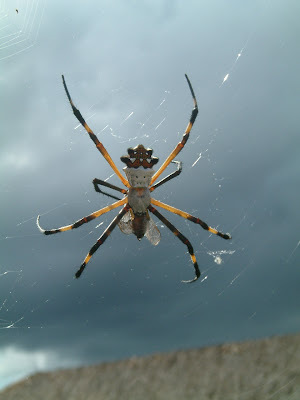 Do you know what kind of spider it is? She says the abdomen is the size of a large grape, which is enough to make me swear off grapes until they get below $1.99 a pound again. The grape growers of the world don't thank you for that reference, Bonni. But I hope someone can figure this one out for you. 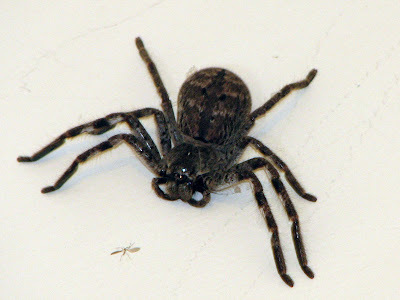 For myself, I'll retreat to my own bathroom where spiders never get big enough to leave too much of a smear on the wall. 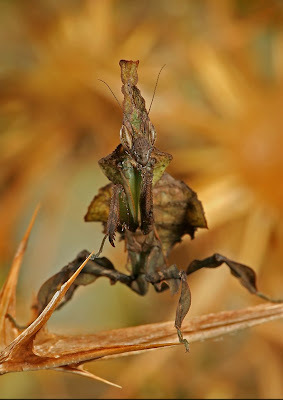 This might be an ambassador from the spider federation, gesticulating in an effort to get our attention. Or maybe he'st brandishing those legs to scare us off. But most likely, this male Saitis barbipes, endemic to the Mediterranean and the most colorful of the European jumping spiders, is trying to court a female. 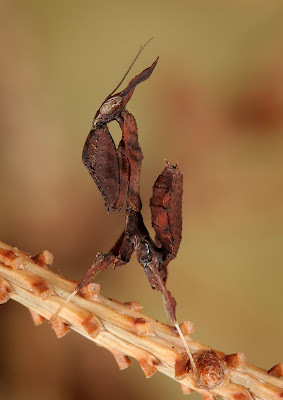 The third set of legs on the males of these diminutive (less than a centimeter) spiders is used to wave and audibly vibrate when trying to court a female. 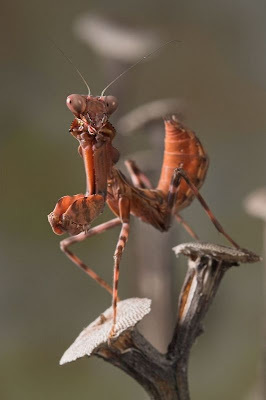 If the female is sufficiently wooed, she'll collapse on her legs and turn her abdomen up. Barry White is played, the hearth is lit, and another batch of spiderlings is conceived. 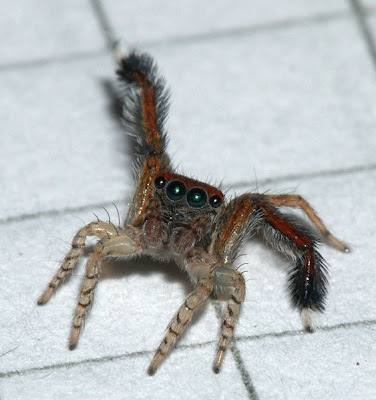 Thanks for the new Salticid, Angela. Your spider federation still might come to pass. 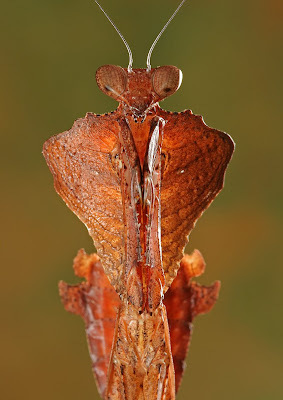 It turns out that Opo Terser was the photographer who captured those amazing jumping spider faces. 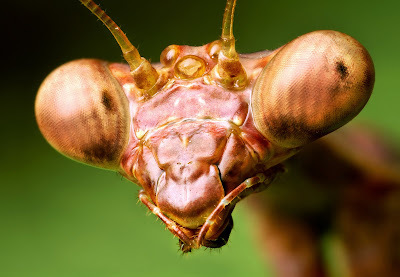 Opo's been gracious enough to let me use some more photos, so I went digging and discovered that Opo has looked more than spiders in the eyes. Enjoy this montage. 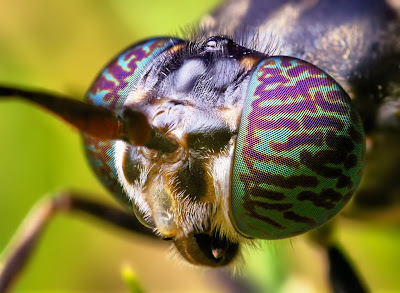 Large fly head. Looks like a baseball whose seams are coming undone. 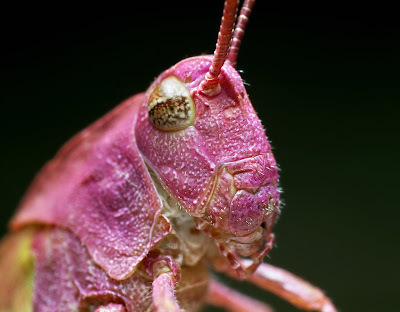 Pink Grasshopper (species unknown). My girls want one for a pet. Continuing with the owl theme, here's a little African owl (species?) squaring off with a barn owl. No owls or handlers get hurt, but the owl looks like he's either about to throw his back out or pass a large stool (the eyes, THE EYES!). The barn owl seems unimpressed. Enjoy. UPDATE: Looking like its a White-faced Owl (Ptilopsis) probably Ptilopsis leucotis. Thanks, Neil and Leslie. 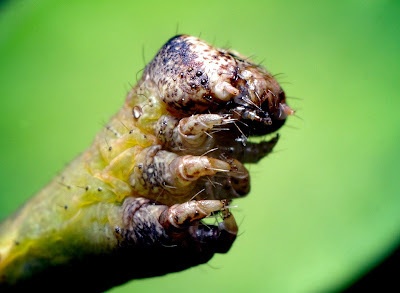 Jelo has introduced yet another new critter to Ugly Overload. 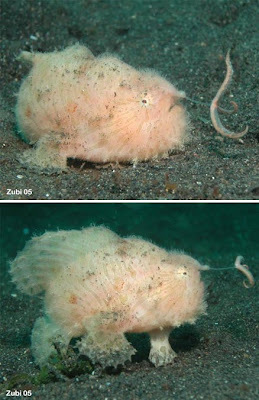 Everyone say hello to anableps (Anableps anableps), the bifocal fish. This fish would do Benjamin Franklin proud. 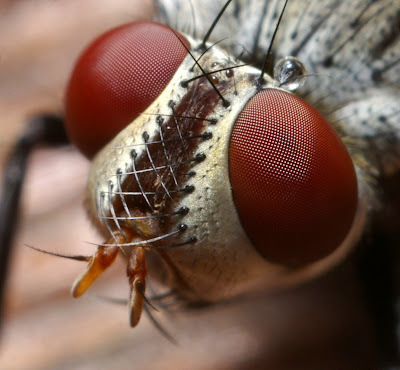 Some of you bespectacled readers might wear bifocal lenses so that you can with a flicker of your eye see something up close and then far away (something we non-spectacle-wearers take for granted). 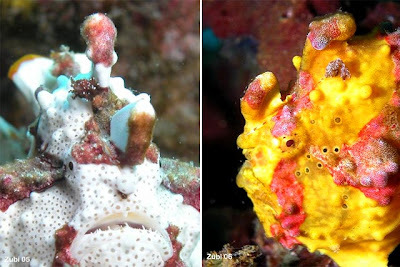 These fish have taken that idea and modified it for their own uses. 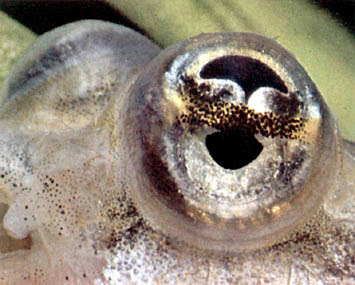 Their pupils are divided horizontally, allowing them to at once see both above the surface of the water, and below it. Since they spend most of their lives swimming in schools skimming the water's surface, this is a handy trait to have. My, what divided eyes you have. 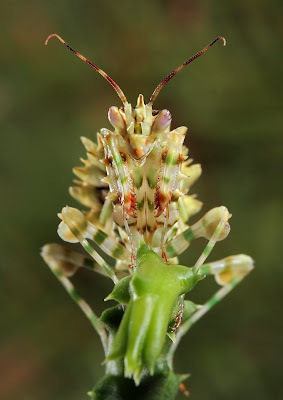 All the better to see both prey and predator, my dear. But more than just those eyes, check out that grimace. 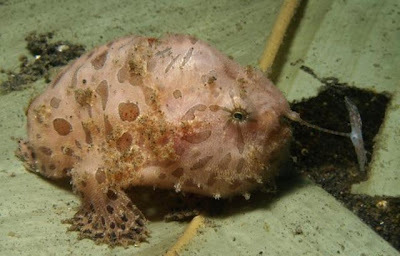 Why so sad, bifocal fish? The Barn Owl (Tyto alba) is one of the most widely distributed owls on the planet. Chances are, if you are reading this blog, you've got barn owls nearby. I've encountered them many times, and can often hear them screeching when they fly over head (they are known for their frequent calls). I've also stepped in freshly regurgitated owl balls. That is a wonderful experience, what with the crunching of mouse bones and the gooey strands of squirrel hair on your shoes. 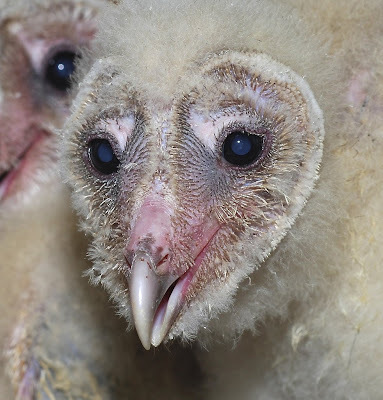 Monkey-faced Owl, Ghost Owl, Church Owl, Death Owl, Hissing Owl, Hobgoblin or Hobby Owl, Golden Owl, Silver Owl, White Owl, Night Owl, Rat Owl, Scritch Owl, Screech Owl, Straw Owl, Barnyard Owl and Delicate Owl. 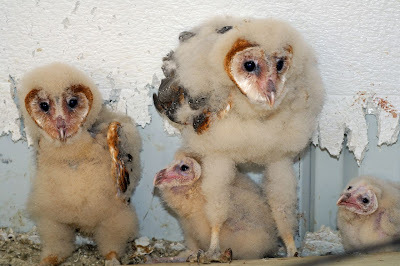 Baby birds always look awkward, but this little brood of barn owlets can take solace in the fact that they aren't a threatened species, relocating isn't a problem, they can hunt in complete darkness, they fly silently, and they'll soon be the stuff of nightmares to rodents the world over. I don't know who took these photos (though I have my suspicions). Can anyone claim them? I must know! I want to shake his/her hand and post more of their photos. UPDATE: I must be tired. Tragerstreit pointed out that the first photo has the illustrious Igor Siwanowicz's watermark on it. I still can't speak of the rest. 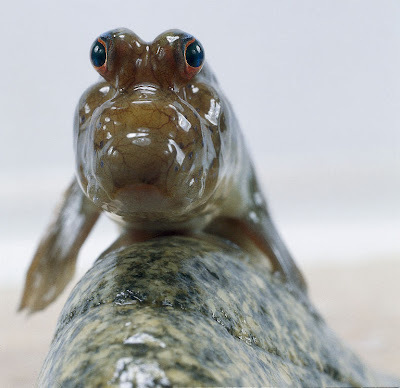 Jelo pointed out that I've been remiss in posting on the comely mudskipper (only one post in over three years). So here goes. 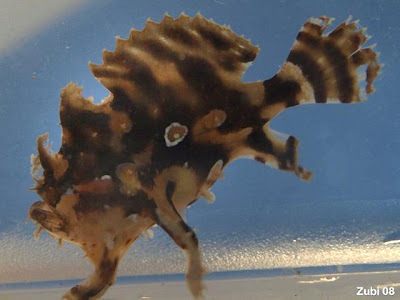 They're found in intertidal regions and in areas such as tropical mangrove swamps where fresh water meets salt water (I sense a folk song in there somewhere...). 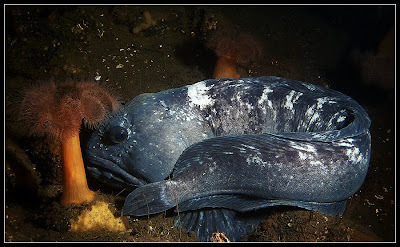 Think of them as the amphibious form of gobies--because that's pretty much exactly what they are. 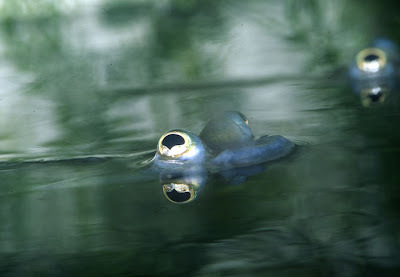 Amphibious fish? Yes, ma'am. 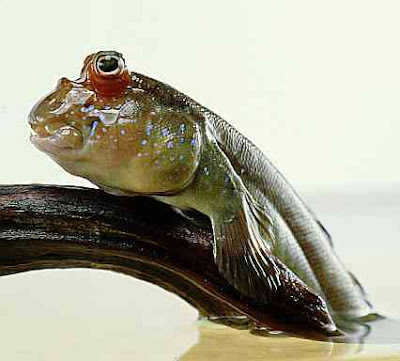 As long as they stay wet, they can aspirate through their skin, throat, and mouth lining (mudskippers are the anti-mogwai, they must get wet). 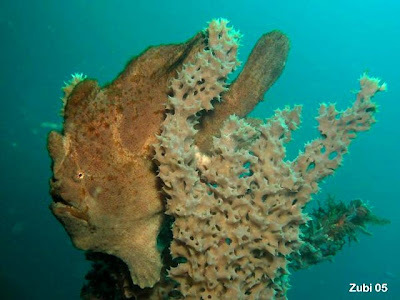 These fish are also equipped with large gill chambers that allow them to retain water, like a fish variant of the scuba tank. Redundancy. These are very prepared fish. That last shot isn't one of a singing duet. 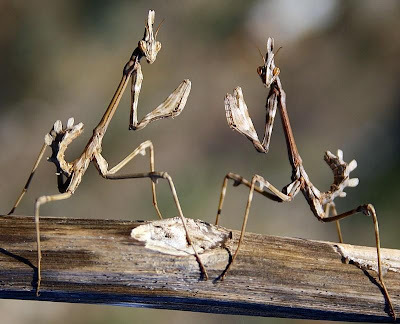 It's two rivals males in combat. They are territorial little fish. 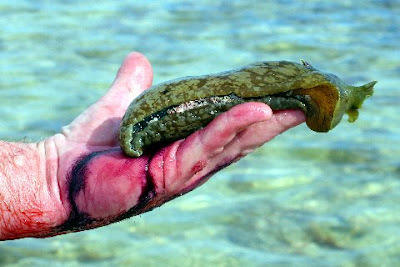 The Aplysiomorpha family of sea slugs is a large one. It includes, arguably, the largest gastropods on the earth (a coveted title). 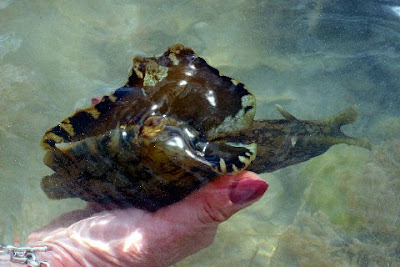 They are called sea hares. 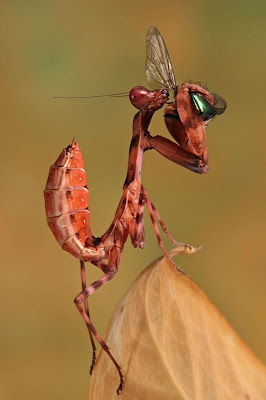 Here is one such creature. Herbie took these photos in Key West, Florida, US. His hand is in no jeopardy, since the sea hare only puts its rasper to use on sea weed. 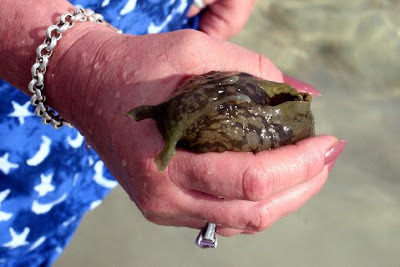 And neither is the sea hare in any danger. That last shot isn't a gory one. 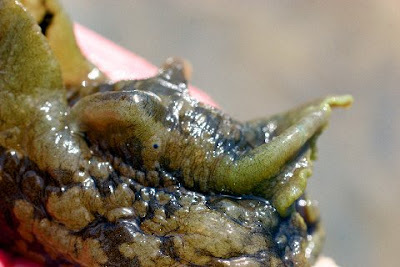 The sea hare squirts dark ink ("You made me ink.") It just happens to look like blood. Not a bad choice of color, really. All we need now is a sea tortoise, and we've got a marine fable to tell. Anyone got one? I've always wanted to go to Cozumel for the drift diving and the Mayan ruins. Andrew may have ruined that dream of mine. 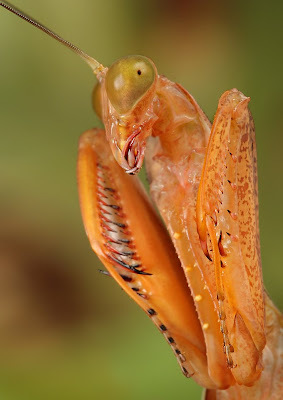 While exploring one such Mayan ruin, he came across this monster devouring its winged prey. He would like some help in identifying it. 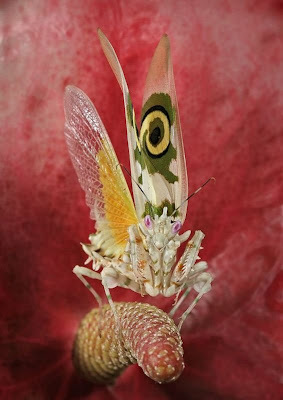 My best guess is that it is a descendant of the spider god recently revealed in the Mayan ruins at Collud. Any other thoughts? Thanks for the spider, Andrew. Dark Roasted Blend has done a fantastic spread on the many varieties of frogfish found the world over. All photos, in turn, come from Teresa Zuberbühler. This article was, in turn (x2), brought to us by Kat. 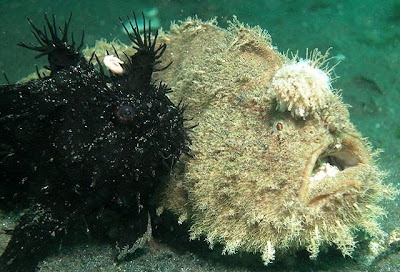 Frogfish are anglerfish, as indicated by the dangly lures they employ to bring their prey in close. 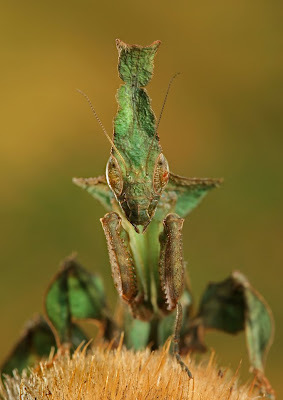 They are ambush predators, as shown by their amazing camouflage and propensity to sit in place as long as needed. 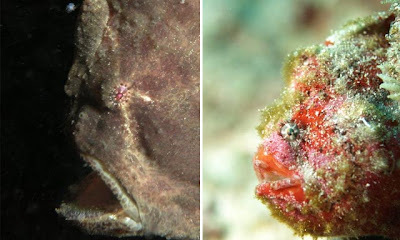 Now, enjoy the frogfish, and be grateful they aren't terrestrial and about 20 times larger.